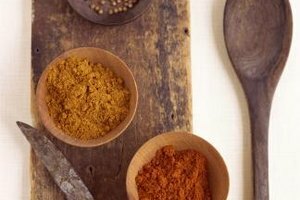 How Much Turmeric Powder Is in Curry? Thai curry paste is like Grandma's famous soup -- no two are alike and variations in spices make it special. 3 How Much Turmeric Powder Is in Curry? 4 What Is Harissa Sauce? Thai red curry paste is paramount for authentic-tasting Thai cuisine, and though it can be difficult to find in a regular grocery store, there are many alternatives. Substitute the basic ingredients to make a quick version, or spend a little bit more time to make an authentic paste that can be stored for later use. Green or yellow Thai curry paste can make an acceptable substitute, too, if you aren't worried about the color. When it comes to Thai curry pastes, there isn't actually much difference between the different colors -- the main ingredients in each paste are the same and variations in color come from extra spices added. Red curry paste is so because of the red chilies it contains and the use of cilantro roots instead of leaves; green gets it's hue from green chili peppers and the addition of cilantro tops and green chile leaves and yellow's golden glow hails from turmeric. The different colored pastes are traditionally used in different curries with distinctive main ingredients, explaining the variation of tastes. An easy substitution for Thai red curry paste is to simply use a different color of paste. This quick fox won't have the subtle innuendos of authentic Thai red curry paste, but it covers the major flavors and is a good substitute in a pinch. In a blender or food processor, or with a mortar and pestle, blend chopped lemon grass, fresh ginger root, garlic cloves and shallots or onions into a fine paste. Add cayenne pepper or any dried red chile to taste. Adjust your final dish for spiciness and salt -- most curry pastes contain fish sauce or paste that contributes extra saltiness. If time is not a factor and grocery store ingredients don't limit you, consider making your own Thai red curry paste. In a food processor, blender or mortar, blend chopped galangal or ginger, chopped garlic and sliced lemongrass. Add shallots, shrimp paste or fish sauce and a kafir lime leaf. Next, add whole spicy red chiles, or substitute paprika to cut some of the spiciness. Dress it up with a teaspoon of coriander, cilantro, cumin or black pepper. Soy sauce or a mixture of lemon juice and salt can be used in place of shrimp paste for a vegetarian alternative. Regular lime or lemon leaves can be used in place of kafir lime leaves. Homemade or store bought paste, once opened, will keep in the fridge for up to two weeks. Paste can be frozen in user-friendly sizes -- think small scoops on wax paper. Freeze until solid, then move to a small baggie and keep frozen until ready to use. Curry paste kept in this way can be kept for up to a year, then added directly to the recipe from its frozen state. What Food Coloring Combinations Do You Use to Make Gray Frosting?